Temperament: The temperament of the Giant Schnauzer should be sound and reliable, and according to the AKC breed standard, should combine "spirit and alertness with intelligence and reliability" and be "composed, watchful, courageous, easily trained, deeply loyal to family, playful, amiable in repose, and a commanding figure when aroused." The first breed standard for the Schnauzer was written in 1907 and the first Giant Schnauzer, "Roland Rolandsheim", was exhibited at an official show in Munich in 1909. The exact makeup of the breed today is still unknown but it is speculated that Standard Schnauzer, an extinct dog called the Oberlander, various farm dogs, and possibly Bouvier de Flanders are all possible ancestors. It wasn't until about 1914 that the modern Giant Schnauzer was developed by a man named C. Calaminus who never revealed the breeds he used. We do know that he used the black Oberlander dogs, and possibly some Great Dane, but there is no actual evidence. Some early notable giants with photographic evidence are Bazi v Wetterstein and Felz v Kinzigtal. In 1923 the PSK (Pinscher Schnauzer Klub) in Germany, the breed's country of origin, published the first standard for the Giant Schnauzer. It said “The Giant Schnauzer will be the best possible, considerably enlarged and strengthened copy of the Standard Schnauzer.” The height was fixed at 21.5 to 25.5 inches. Mental characteristics, along with size and structure were described as such: “All these allow the Giant Schnauzer to perform the hard and strenuous life of a working dog.” From 1923 to around 1938 the Giant thrived, and in 1927, the PSK had the first "Bundesliestungsiegerprufung" (national championship, working trials.) This national competition was annual until 1938 and cancelled in 1939. World War II then wiped out many Giant Schnauzers, but the Germans started again in 1945 to rebuild the breed with dogs remaining from around the world. This was also complicated by the Berlin Wall which separated East and West Germany and therefore the breeding pool as well between 1961 to 1989. After the unification of Germany, the bloodlines were crossed and our modern day gene pool consists of everything that survived these historical events. The community of owners of Giant Schnauzers reports concern for the following illnesses: squamous celll carcinoma, toe cancer, and melanoma, autoimmune diseases including thyroiditis, epilepsy, cadiac diseases SAS and dialated cardiomyelopathy, lyphomas, hip dyplasia, eye disorders (cataracts and PRA), AIHA, IMTP, SLO, and cobalamin malabsorption. There is clearly a genetic split in the breed between black Giant Schnauzers and Pepper Salt Giant Schnauzers. Each of these populations are more related among themselves than with each other. The Average Genetic Relatedness (AGR), which is the genetic equivalent of the pedigree based calculation "mean kinship," show that overall relatedness is close. This means breeders must make a specific effort to breed to the least related quality dogs they can find, in addition to prioritizing genetic outliers, in order to maximize retention of existing diversity in the breed. The Giant Schnauzer has retained a broad range of diversity in the DLA haplotypes, which means they have kept much of the early diversity of the founders of the breed. The initial study of 146 dogs revealed 14 Class I individial DLA haplotypes and 15 individual Class II haplotypes. This is promising for the future of the breed, since some breeds have very few left. It is possible to retain that diversity and this may indicate that there is more overall diversity still to be found in the world. Nevertheless, there seems to be a significant concern with autoimmune disease in the breed, which tends to be more attributable to low overall diversity, not only homozygous DLA haplotypes. 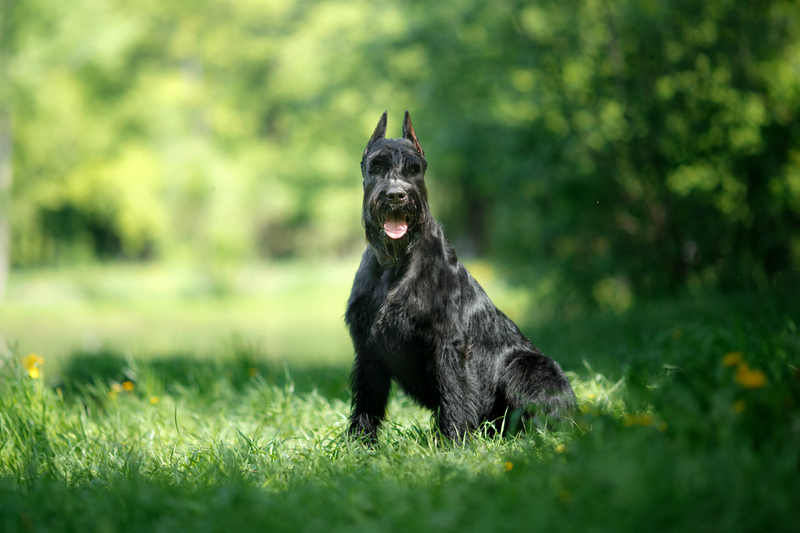 Giant Schnauzer breeders should take care to assess each puppy they produce or plan to keep for genetic diversity as well as quality breed traits. Dogs with low Outlier Indices (OIs) should be kept in the gene pool if the have robust good health and are excellent representatives of the breed. Dogs with higher OIs should be given a bit more leeway when considering them for a breeding program because removing them from the gene pool is more likely to limit existing diversity further. Health testing and selection for appropriate traits and temperament cannot be replaced by genetic diversity testing, of course, but genetic diversity results can vastly enhance the breed community's ability to preserve the longterm viability of the breed.